I'd So Rather Be Reading: Thank You! 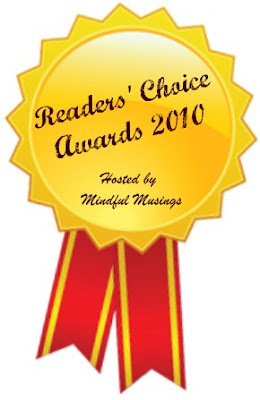 We found out today that we tied for seventh place in Mindful Musing's Reader's Choice Awards 2010 for Best New Blog! We are so honored and excited! Congratulations to all the nominees and other winners---we were thrilled just to be nominated for this honor. Make sure and visit Mindful Musings to check out all of her Best of 2010 winners. Congratulations ladies! I was SO happy for you when I say this! WOO HOO!!!!! You ladies rock, congratulations! I'm so happy! Congrats, ladies. Congratulations!!! Well deserved ladies. I'm glad I found your blog and I love our chats! You both deserve it for the amazing reviews and updates on your site.